In the United States, only 30% of women who undergo mastectomy also undergo breast reconstruction. Of those women who undergo breast reconstruction, about 80% decide to undergo breast reconstruction with implants. Most women undergo implant-based breast reconstruction because it is simpler, scars are limited to the breasts, and the recovery is often faster immediately after surgery. Over the long term, implants may cause more problems than natural tissue breast reconstruction, but implant-based surgery is often easier for women in the short term. Traditionally, implants were placed under the pectoralis muscle because the tissue left behind by the mastectomy was very thin and there was a risk that the implant would erode through the skin. The rationale was that by placing an implant underneath the pectoralis muscle, there was an extra layer of tissue between the implant and the outside world to prevent the implant from becoming exposed. If the implant did erode through the skin, it was considered infected, and would need to be removed with no breast reconstruction for 6-12 months. The risk of complications was even higher for patients who underwent radiation, since radiation damage made the skin less elastic and more difficult to heal. In fact, radiation treatment has long been considered a relative contraindication for breast reconstruction with implants. Over time, however, mastectomy techniques have improved so that breast surgeons are less likely to resect too much breast tissue so that it leads to the loss of the breast skin. The improvement in mastectomy techniques makes it possible to place breast implants over the muscle. Placing the breast implant over the muscle and directly under the skin – prepectoral breast implant placement – is anatomically correct, as the anatomic position of actual breast tissue before mastectomy is over the pectoralis muscle and under the skin. Since the pectoralis muscle ordinarily lays flat against the chest wall, placing the breast implant under the pectoralis muscle – or subpectoral breast implant placement – is unnatural and uncomfortable. When a foreign body is placed underneath the pectoralis muscle, it is like having a stone in a tight shoe that you cannot remove. When a shaped cohesive gel breast implant is placed over the muscle in the prepectoral position, the implant is anatomically positioned in the same spot where the breast tissue used to be. The result is much more natural and comfortable, and since the implant is over the muscle the action of the pectoralis muscle does not force the implant into the armpits. One concern with placing breast implants over the muscle is that the pectoralis muscle is not providing an extra layer of tissue over the implant. To make up for this, plastic surgeons can use acellular dermal matrix (ADM) to provide an additional barrier between the implant, the skin, and the outside world. Harvested from the dermal layer of human skin, ADM has been stripped of reactive cell components but retains the strength and flexibility of skin due to the biologic qualities and structure of natural collagen. Not only does the ADM provide an extra layer of soft tissue coverage over the implant to prevent exposure, but it can also soften the edges of the implant itself so that the outlines of the implant are not visible through the skin. 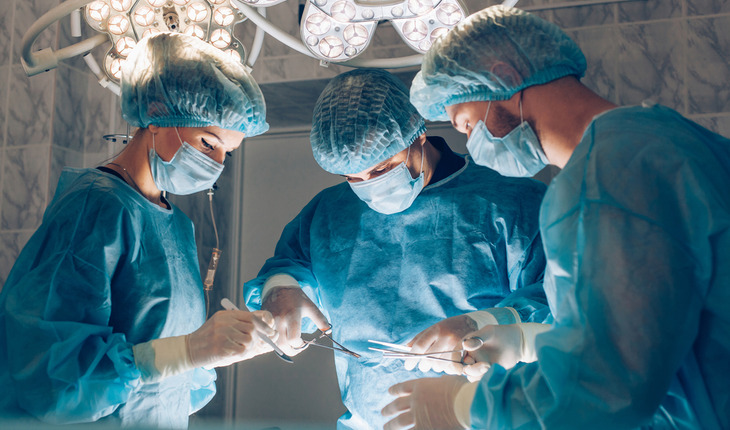 The use of ADM may slightly increase the risk of infection and seroma formation, but it has been used in conjunction with subpectoral implant breast reconstruction for many years and is considered the standard of care. Prepectoral breast implants require more ADM than subpectoral breast implants, so the risk of infection and seroma formation may be slightly higher. One advantage to ADM is that it eventually integrates into the body and develops a blood supply. Once this occurs, it is incorporated by the body and is less likely to develop infection or other problems. ADM is also believed to reduce the risk of capsular contracture. Breast reconstruction with prepectoral cohesive gel implants wrapped in ADM is a significant advance in implant-based breast reconstruction. While natural tissue breast reconstruction has fewer problems over the long term, prepectoral implant breast reconstruction is a reasonable compromise for women who are unable or unwilling to undergo breast reconstruction with their own tissue. The use of ADM may theoretically increase the risk of infection and seroma in prepectoral breast reconstruction when compared to subpectoral breast reconstruction, but the underlying issue in both prepectoral and subpectoral implant-based breast reconstruction is that implants and ADM are foreign bodies with no blood supply. Implants and ADM are fundamentally problematic, and any type of implant-based breast reconstruction will inherently have higher risk of complications over a lifetime when compared to natural tissue breast reconstruction. If a woman is committed to undergoing breast reconstruction with implants, however, placing breast implants over the muscle in prepectoral breast reconstruction will give her the most natural and comfortable outcome.